(From EPFL News)— Myoglobin is a protein found in muscles, where it binds and carries oxygen to cells, which then use it to generate energy. Oxygen binds to the iron atom of a small molecule called heme within myoglobin, but heme can also bind other two-atom (diatomic) ligands, like nitric oxide. Nitric oxide is particularly interesting, as it is involved in many important biological processes. So far, studies into this relationship have been indirect and lacking information about the overall structure of heme – especially the iron atom within it. Consequently, models on how nitric oxide binds to the heme of myoglobin have been incomplete. Using a cutting-edge spectroscopic method, EPFL scientists have been able to study ligand binding in myoglobin down to a billionth of a second by specifically looking at the iron atom. The work, published in PNAS, paves the way for studying similar proteins with unprecedented precision. The lab of Majed Chergui at EPFL pioneered a powerful technique called “time-resolved X-ray absorption spectroscopy” (XAS). The technique can capture detailed information about the electronic structure of specific atoms in a molecular system, as well as the geometry around them. One advantage of this approach over other techniques, e.g. X-ray diffraction, is that the sample is in a solution that matches the physiological conditions of the body. In time-resolved XAS, scientists can mimic how a ligand, e.g. nitric oxide, detaches from myoglobin – or, more specifically, from the iron atom inside myoglobin’s heme molecule, by exciting the latter with an ultrashort pulse of green light. After the ligand detaches, it goes back to bind the iron atom again. This re-binding can be probed with a second pulse, this time an X-ray one. By choosing the right X-ray energy, scientists can select a specific element in the sample. In this case, it was the iron of the heme. This re-binding of nitric oxide has puzzled researchers for a long time. The reason being that conventional optical spectroscopic methods are not structure-sensitive. Some theories suggested that after nitric oxide re-binds, the heme forms an intermediate, “domed” structure, which does not occur with any of the other diatomic ligands (cyanide, carbon monoxide etc). Using their spectroscopic system, the EPFL scientists were able to confirm for the first time that this domed intermediate does indeed occur after nitric oxide rebinds to heme. They also showed that the 200-picosecond timescale is actually due to nitric oxide molecules coming from remote docking sites in the protein. This is the first ever demonstration of picosecond element-specific probing of a biological function – and Chergui is optimistic about its future use. 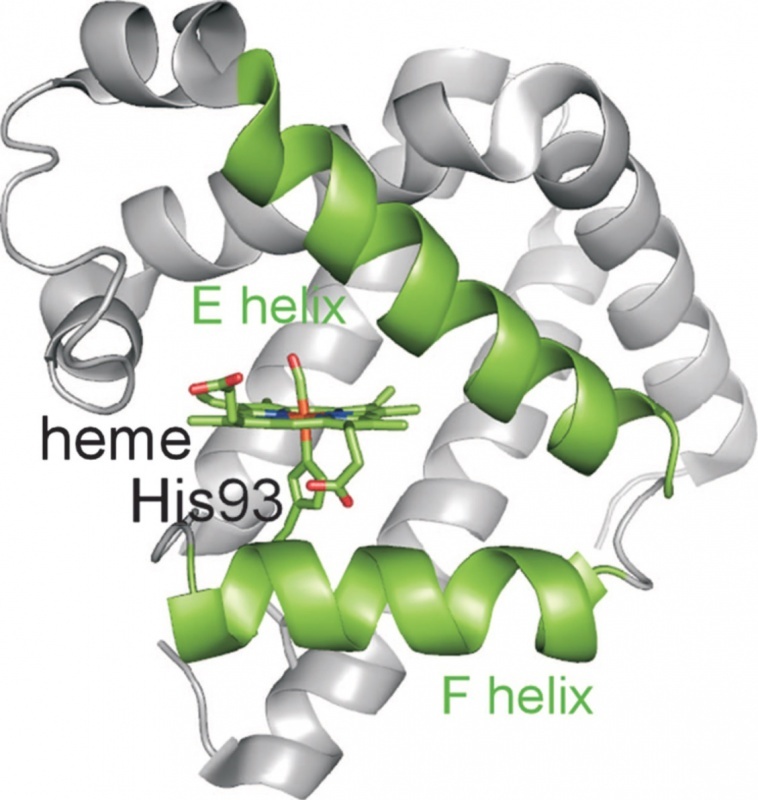 “Our study shows that this kind of ultrafast X-ray spectroscopy can work extremely well with proteins in physiological media, and we can now consider other metalloproteins such as those involved in photosynthesis,” he says. This work involved a collaboration of EPFL’s Laboratory of Ultrafast Spectroscopy with SwissFEL and Swiss Light Source of the Paul Scherrer Institute. It was funded by the Swiss National Science Foundation (SNSF). Figure 1. 3-D structure of myoglobin. Silatani M, Lima FA, Penfold TJ, Rittmann J, Reinhard M, Rittmann-Frank H, Borca C, Grolimund D, Milne CJ, Chergui M. NO binding kinetics in Myoglobin investigated by picosecond Fe K-edge absorption spectroscopy. PNAS 05 October 2015. DOI: 10.1073/pnas.1424446112.